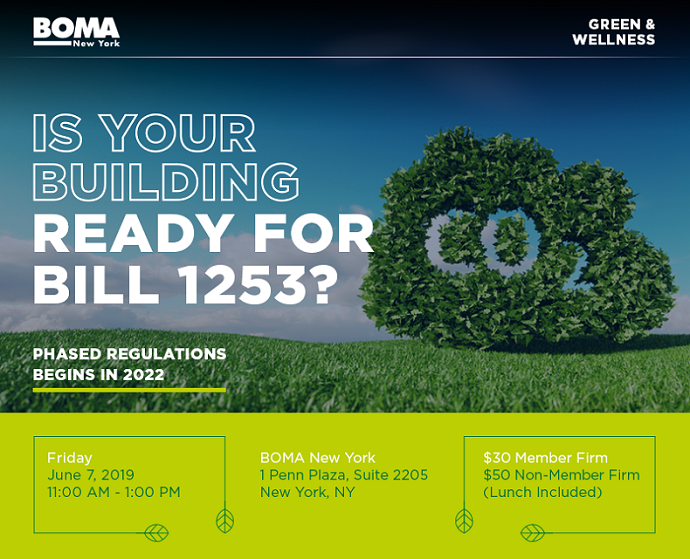 BOMA NY June 7, 2019 LEED Lunch N Learn: "Is your Building ready for Bill 1253? " Is your building ready for Bill 1253 ? Set for a final vote on April 22 2019, NYC Bill 1253 will be a first-of-its kind legislation requiring substantial reductions in building energy use. The bill will require a phased Greenhouse Gas (GHG) Emissions reduction of 80% by the year 2050. This bold plan will place NYC squarely on the path to achieving its GHG reduction goals.